So, it's Monday and Diabetes Blog Week is officially over. All I can say is . . . . WOW!!! Just WOW!!! Beyond that, I'm having a very hard time putting everything that last week was into words. But I'll try. We had 142 (Oh My Goodness, 142!!!!!) blogs participating in Diabetes Blog Week. (And I still have hundreds of posts left to read, but I promise I will eventually read each and every one of them!) Participants were a mix of Type 1s, Type 2s and parents with diabetic children. To be honest, I had no idea just how many diabetes bloggers were out there, and I'm lucky to have made so many new blog friends along the way. I'll be leaving the participant list under the header for a while - and later I'll move it over into my sidebar. In addition to thanking all of the bloggers who made Diabetes Blog Week a success, I'd like to thank those who helped spread the word. Kerri kindly put up my guest post the same day I announced Diabetes Blog Week - I knew there would be more traffic to my blog when she ran my post and we could get the word out faster. 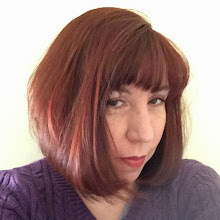 Amy put up a blurb in her Weekly Nuggets. Christopher had me on as a guest on the Just Talking podcast. 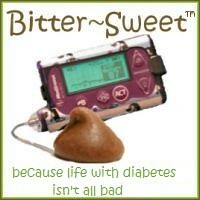 And Riva has written a great post on Diabetes Blog Week for the Huffington Post. In my opinion, the best thing about Diabetes Blog Week was that it brought us all together. I loved getting email from people telling me how great it was to read all the posts and realize that others have the same issues that they do. We shared our tips, our ideas, our frustrations and triumphs with each other. And hopefully, we helped educate those outside of our diabetes blog community about what it's really like to live with diabetes. So thank you - to everyone who blogged during the week and shared with us. Thank you to those who read the posts and left comments. It was a great week that never would have happened without your enthusiasm. And I'm thinking maybe in a year, we can all come together again for the Second Annual Diabetes Blog Week? What do you say? Seriously, though, I had a great time! Thanks for starting this, Karen. Thank you Karen! It was so unifying and great to find new friends. The week may be over, but so much else has just begun! Congratulations on a tremendous accomplishment! Karen, the thanks goes to YOU for being the brainchild behind this whole thing! So thanks again and you know I'm in for next year!! I think Day 7 should be a post about stuff we've learned from other blogs or the experience of coming together online...I'll be creating a DAY 8 for this year...as soon as I have a chance to take a breath. It truly was an amazing experience. Thanks for keeping the blogs up so I can still peruse them. I'm not finished with them yet!!!!! GREAT WEEK, GREAT FUN, GREAT FRIENDS! Thank you, Karen! What a week. What a week! Thank you so much for putting it toghter I am in for next year. What a great idea!!! Thanks so much. I used to blog, but then stopped out of sheer laziness. I didn't participate in the weekly blog...but it totally rekindled my love and desire to blog again. I had no idea there were so many Diabetes blogs out there. I was extremely encouraged and picked up some great tips and ideas for exercising...and best of all, was reminded that I'm not alone in this!!! Yes! Do it again next year! It was fun and I've also "met" other bloggers. Thank YOU for starting this. Yeah, I'd do it again! count me in for next year...I'm looking forward to it!! Hi! I just wanted to thank you, too. I'm new to the whole D community. My 9-year-old son was just diagnosed in March. Through your topics and all the blogs everyone was writing, I learned so much that has helped me already!! I'm only indirectly impacted, but found this very interesting and informative! Thank you for organizing blog week. I loved it and would definitley participate again. It was so great to read other peoples feelings and ideas about diabetes. Thank you again for doing this... it was a great idea. Thank you for orchestrating such a great idea! I look forward to DBW II. But in the meantime, maybe you could prompt us to do an occasional topic? :0) It's very cathartic to share, and know others are right there, too. Can't wait until next year....wait, maybe I can! I am exhausted. I will be in for next year for sure though! Karen, thanks again for getting this whole thing going. It was a lot of fun to participate and to read what everyone else wrote. I'm definitely in for next year. This was such a great idea --- thank you so much for putting it together! I can't wait for next year! Bring it! Ahhhhh, I missed it :( Just recently got attached to this site. Any plans for more? Sure would love to be a part of it. Thanks Karen, and to everyone who participated. Admittedly, I got sick in the middle of the week and am still catching up on the posting (I will finish! ), but it was great to get to know so many new d-bloggers. Thanks again! Yeah - it felt weird this morning not having our assigned project to write about today (and this coming from a gal that HATED school with a passion when it came to assignments). Thank you, Karen! It was a great experience. I had fun getting to know my fellow d-bloggers and felt a part of a real d-community! This was AWESOME! I loved it so much. I'm still trying to get through reading through all the blogs. I can't even tell you how many times I was moved to laughter or tears through the reading. Thanks so much!!! I can't wait until next year! Thanks so much Karen This was a fantastic idea. Thanks so much for organizing everything. It was a great idea and looked to be a great success. I am looking forward to the next one. So we should all combine them and make a book out of the posts. I would love it! 7 chapters. 1 for each day? Yes! My dad says it should be an annual event - so there you have it! And the book idea sounds pretty neat too. Yes Yes Yes to the annual event! I'm definitely in next year. Thank you for doing this....I met so many bloggers that I hope to continue sharing with!